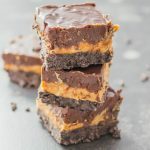 These no-bake Oreo peanut butter bars with chocolate chips are an easy summertime dessert with three delicious layers. Make the Oreo crust: Line an 8x8 inch baking dish with foil and butter the sides and bottom. Add Oreos to a food processor and pulse until finely crushed. Using a large mixing bowl, melt butter in a microwave. Add crushed Oreos and mix well. Distribute over the baking dish, pressing it flat over the bottom of the baking dish. Place in the freezer while you work on the next step. Make the peanut butter filling: Using a large mixing bowl, melt butter in a microwave. Add peanut butter and sugar. Mix well. Distribute the mixture over the crust. Place in the freezer again while you work on the next step. Make the chocolate topping: Add chocolate chips and peanut butter to a large mixing bowl that is heatproof (like glass). Place heavy whipping cream in a small saucepan over medium-low heat, and bring to a simmer. Then pour the cream over the chocolate chips and peanut butter. Mix until completely smooth. Pour this chocolate mix over the filling in the baking dish, spreading evenly. Cover and refrigerate overnight or at least a few hours. Serving: Lift up the sides of the foil to remove from the baking dish. Cut into 16 squares.